Feeling bugged? After checking out the food in this post, the only thing that might bug you will be your calorie count! Today’s post will be written by the second in command here at the Disneymeals house. Our commander in chief is pulling some overtime at work, so Queen Ant (Mary) is blogging this cook. A Bug’s Life. A movie about bugs, and their short little lives. First up, we have pie. At the bug circus, our crew wasn’t performing so well, and they had little berries and mini-berry pies thrown at them. Poor circus bugs. However, the pies were boysenberry, so it can’t have been all bad. Boysenberry pie is pretty delicious. In a bowl, cream the sugar and butter and eggs. 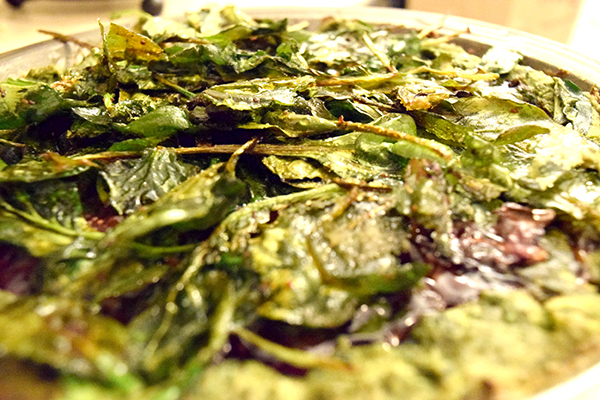 Place crisped spinach on top of pie. After the circus ends, the bugs are shown to be at a bar. There’s all sorts of “food” and “drinks” at this grimy establishment (I wouldn’t trust anything that came outta that bar, personally). The bartender brings out a tray and asks, “Who ordered the poo poo platter?” After which some brown much on the tray is swarmed by flies. Well we know where to draw our line, there is no way we will be eating poop. However, some research showed us that there is such a thing as a pupu (pronounced poo-poo) platter. 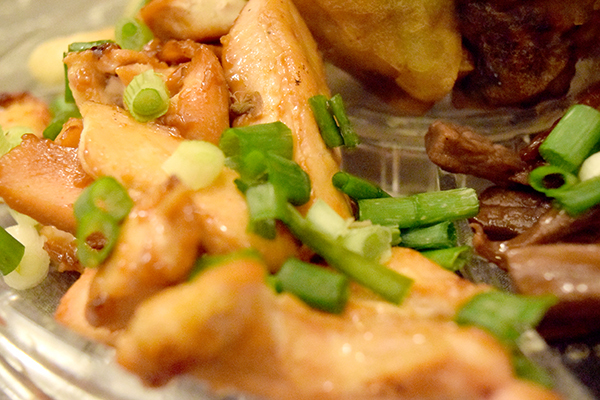 It’s a mash up of yummy Asian appetizers, and appetizers are commonly served at bars, right? That sounded good enough for us. 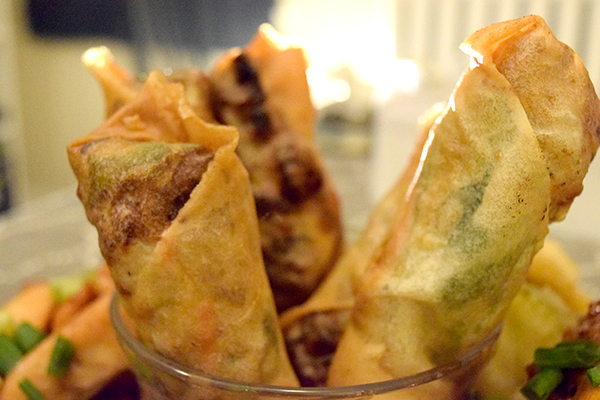 First up: The egg rolls, placed center on our platter. Season pork with ginger and garlic powder and mix thoroughly. Heat mixture in a medium skillet, stirring, until pork is cooked through and no longer pink. Set aside. In another large skillet heat oil to about 375 degrees F (190 degrees C) or medium high heat. While oil is heating, combine flour and water in a bowl until they form a paste. In a separate bowl combine the cabbage, carrots and reserved pork mixture. Mix all together. Lay out one egg roll skin with a corner pointed toward you. Place about a 1/4 to 1/3 cup of the spinach, carrot and pork mixture on egg roll paper and fold corner up over the mixture. Fold left and right corners toward the center and continue to roll. Brush a bit of the flour paste on the final corner to help seal the egg roll. Place egg rolls into heated oil and fry, turning occasionally, until golden brown. Remove from oil and drain on paper towels or rack. Put on serving plate and top with sesame seeds if desired. We didn’t have wings for whatever reason, so drumsticks had to do. Man, they were probably my favorite part of the platter. Asian BBQ for the win! 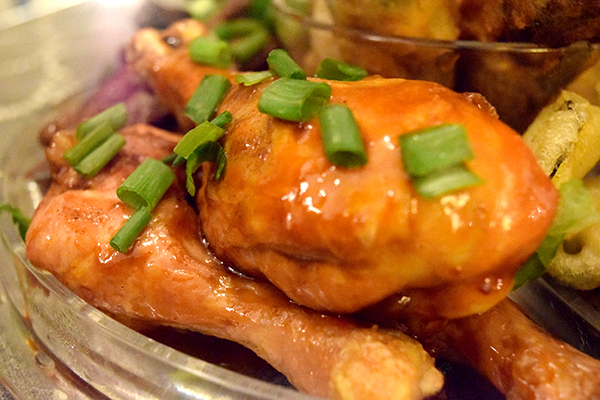 Place the chicken wings on a baking sheet and cook in the oven for 35 minutes. In a medium saute pan over medium heat, add the 2 tablespoons of canola oil and the ginger. Cook for 2 minutes. Add the sherry, vinegar, sesame oil, honey, and soy sauce and chili garlic sauce and continue to cook for 2 more minutes. Remove from heat. In large sauce pot or fryer, heat 3-inches of the canola oil, or enough to prevent wings from touching the bottom of the pan, to 350 degrees F. Add the chicken wings to the oil and cook for about 3 minutes, or until crispy and golden brown. Remove the chicken wings from the oil and drain on paper towels. Add the wings to the sauce. Garnish with chopped scallions and sesame seeds. The chicken teriyaki was baked instead of grilled. It made part 3 of our platter. In a small saucepan over low heat, combine the cornstarch, cold water, sugar, soy sauce, vinegar, garlic, ginger and ground black pepper. Let simmer, stirring frequently, until sauce thickens and bubbles. Place chicken pieces in a lightly greased 9x13 inch baking dish. Brush chicken with the sauce. Turn pieces over, and brush again. Bake in the preheated oven for 30 minutes. Turn pieces over, and bake for another 30 minutes, until no longer pink and juices run clear. Brush with sauce every 10 minutes during cooking. Beef teriyaki was up next. It turned out just a bit chewy, but the flavor was so good. Any bug would’ve been happy with this platter. Slice the fillet steaks thinly across the grain. Toss with seasoning and teriyaki or tamari and sherry. Heat a nonstick skillet over high heat. Add oil and the meat and stir-fry. 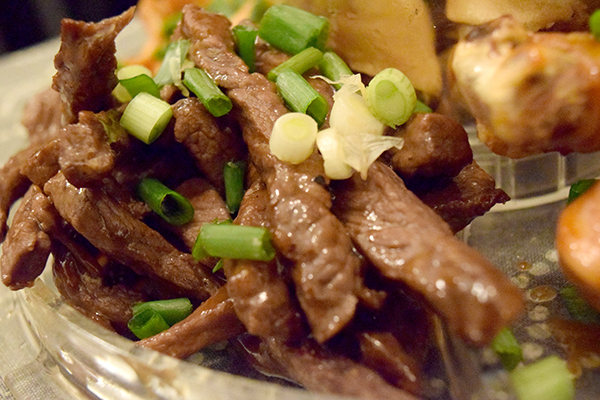 When meat browns at edges, add scallions and cook 2 minutes more, stirring frequently. Last but not least, vegetable tempura. 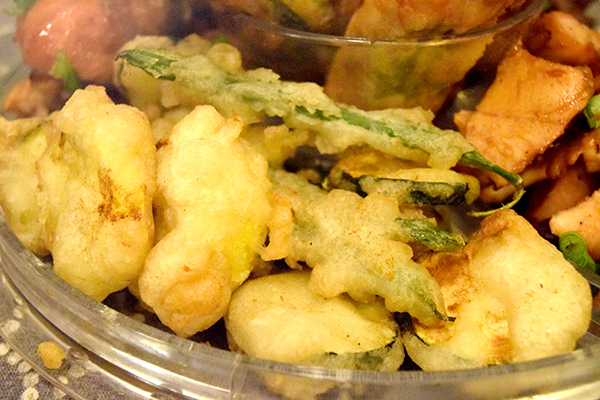 I love tempura fried anything, and these veggies were no exception. Place the cut veggies into the tempura and then into the oil. I can’t say much about the edamame, but you should try it sometime. Preheat the oven to 400 degrees F (200 degrees C). Place the edamame into a colander and rinse under cold water to thaw. Drain. Spread the edamame beans into the bottom of a 9x13 inch baking dish. Drizzle with olive oil. Sprinkle cheese over the top and season with salt and pepper. Bake in the preheated oven until the cheese is crispy and golden, about 15 minutes. 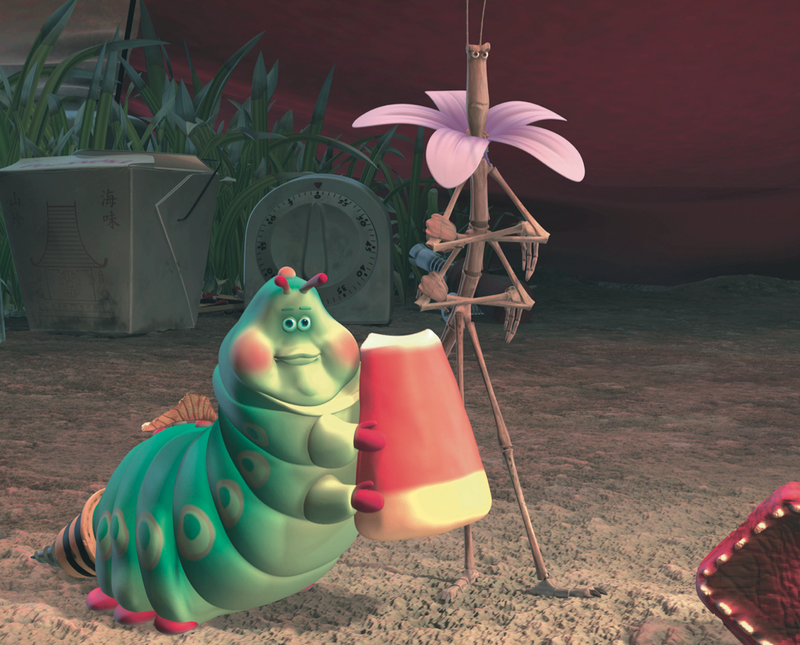 Later on in the show Heimlich the caterpillar is shown eating a candy corn while calling someone a poo-poo head. I like to think they were pupu head’s. Hahaha. 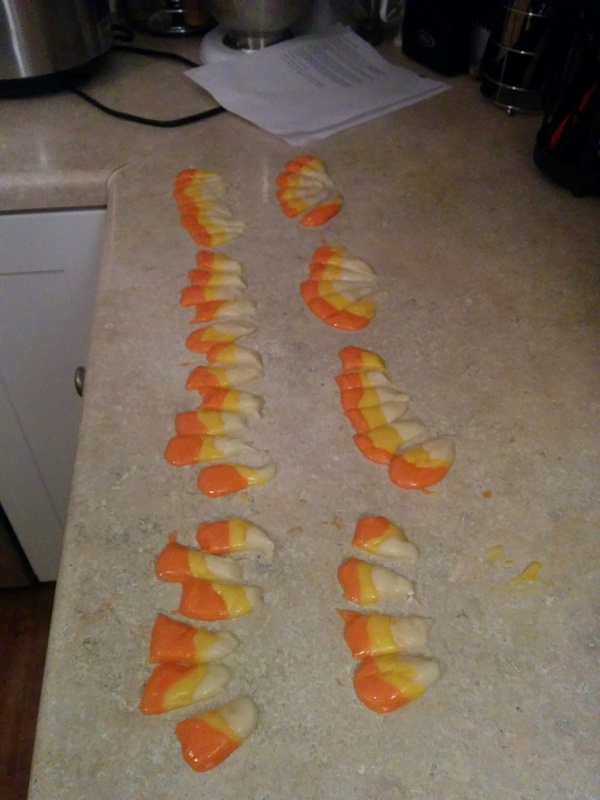 We made candy corn from scratch. Personally, I like the store bought Halloween candy corn better, but this would still make Heimlich pretty happy, it was very sweet. Combine the confectioners' sugar, dry milk and salt in a food processor. Pulse 4 or 5 times, until the mixture is smooth and well combined. Set aside. Combine the granulated sugar, corn syrup and water in a 2-quart pot. Place over medium heat, cover and cook for 4 minutes. Add the butter, clip on a candy thermometer and bring the sugar syrup to 230 degrees F, 1 to 2 minutes. Remove from the heat and remove the thermometer. Add the vanilla and the dry mixture and stir continuously with a silicone spatula until well combined. Pour onto a half sheet pan lined with a silicone baking mat or parchment paper. Cool for 10 to 15 minutes, until the mixture is cool enough to handle. Divide the dough into 3 equal pieces. Add 2 or 3 drops of yellow food coloring to one piece and knead until the color is consistent throughout. Add 2 or 3 drops of orange to the second piece and knead until the color is consistent throughout. Leave the third piece white. Roll each piece of dough into a strand about 18 inches long. Cut each strand in half and roll each piece into a strand that is about 1/2 inch thick and 22 inches long. Lay the strands side by side (orange, yellow, then white) and press them together using your fingers. Cut into 4-inch pieces. Then, using a ruler or bench scraper, press each piece into a wedge, keeping the orange section wide and making the white part come to a tip. Use a wire butter slicer, knife, bench scraper or pizza cutter to cut each wedge into individual candies. Lay the candies on a piece of parchment until dry, at least 1 hour. Store in an airtight container with parchment between each layer. No recipe required for this one. Find a girl named Mary who has O+ type blood, and prick her finger. Well, we’re pretty lucky here at Disneymeals because my name just happens to be Mary, and I just happen to have O+ blood. Mr. Mosquito at the bar ordered this, and got a nice big drop of blood. I’m pretty sure a lot of mosquitoes like O+ bloody Mary’s, at least, they do when I go out and about in the summertime. Will it Turn you into a Beautiful Butterfly? The pupu platter was the best part of the whole movie. If you want to impress your friends, bug or human, make this platter. Those flies knew what they were talking about. Bug pies aren’t as great, since they have to use leaves as crust. Even though the boysenberry filling was pretty good, spinach leaf pie crust is not my favorite. It wasn’t bad, but the flavor combo wasn’t great. Who am I to judge a bug, though? At least they’re healthy. Speaking of which, Heimlich could use a bit of a slim-down. He really needs to lay off the candy corn, they have way to much sugar. Also, our candy corn didn’t quite set, so it was more of a candy taffy. See ya next week, Disneymealers!